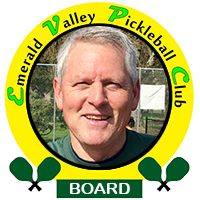 The Emerald Valley Pickleball Club was established in 2015 as a 501 (c)(7) non-profit organization. The club is managed by a board of 5-9 members and continues to have an active and growing membership throughout the Eugene, Springfield and surrounding areas. The club exists to promote and organize Pickleball play for the enjoyment, health and social engagement for players of all ages and skill levels in a collegial and sportsmanlike environment. We also work to insure opportunities for the continued development of all players while working collaboratively with community agencies/organizations to expand pickleball facilities as needed in our community. Roger is the Southwest Regional District Ambassador for USAPA, is a Certified Pickleball Teaching Professional and is sponsored by Paddletek, a leading manufacturer of paddles. He began playing Pickleball in 2012. 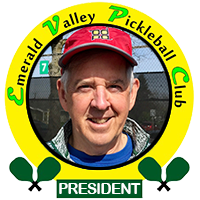 In December 2014, he helped form the initial meeting that led to the formation of the Emerald Valley Pickleball Club in 2015. He lives in Springfield with his lovely wife Janise and chocolate lab Chester. Sally began playing pickleball in 2016 and became a board member in 2017. Her parents encouraged her to try any and all sporting activities and demonstrated that physical activity with a social component would contribute to a happy life. Pickleball is her newest sport and she is thrilled to help facilitate the rapid development of Pickleball in our area. Gloria began playing Pickleball in 2010. She retired in 2007 from the Eugene Police Department, now loves to travel with her husband, Bob. They enjoy motor homing, maintaining their 6 acre home in the Marcola Valley, cruising and being with family. They have four sons and a granddaughter. Mike came to pickleball from tennis in 2015. Other interests include hiking, biking, skiing, fishing, and traveling with his wife, two daughters and six grand kids. Monte has been playing Pickleball since 2014 and joined the board in 2017. He retired from a career as a sales representative for Pepsi in addition to over 30 years coaching baseball and refereeing high school and college basketball. When not playing Pickleball, Monte drives a bus for Springfield Schools, enjoys fishing, golf and spending time with his wife Michelle and their three grown kids and three grandkids. George has been playing Pickleball since 2008 and joined the board in 2016. He played racquetball for 30 years and taught physical education for 45 years. George is an active member of Berean Baptist Church and enjoys working in the yard, traveling, biking, table tennis, horseshoes and the occasional Pickleball tournament. George and his wife have been married over 50 years and have 4 children and 11 grandchildren. 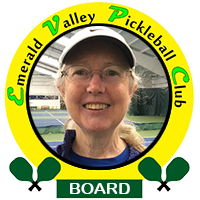 Pam started playing pickleball in 2017 after many years playing tennis. She is a native Eugenian, graduating from Willamette High School and LCC. Pam was elected to the EVPC Board in 2017 and recently retired after 35 years working as a legal assistant. She and her husband Ken, also a Eugene native, have been married 26 years. They both enjoy hiking, biking, traveling, pickleball, and tennis. They have 4 daughters and 5 grandchildren. Lee has been playing pickleball regularly since 2012. He retired as a captain from Eugene Fire EMS in 2005 and drove a bus for Springfield School District for the next 12 years. He stays busy with his grandchildren, a small flock of sheep, lots of yardwork, and hanging out with his dog Otis. Now that he is officially retired, he hopes to travel more and play in more pickleball tournaments.